Why would we, living in a contemporary world, need a bunker? 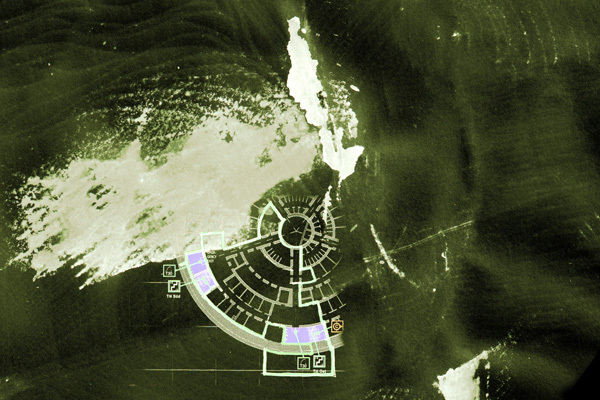 “Faraway, So Close!” – an exhibition presented by eight curators from the Residency program of Node Center for Curatorial Studies, will take place from 25 April until 1 May 2012 at the Fichte-Bunker, in collaboration with Grimmuseum and Künstlerhaus Bethanien. Fifteen international artists present their work inside the historically charged space, offering the possibility to investigate what we see, how we see, and who we are? Daily, hourly, momently, we are bombarded with information, which we conceive to be the real picture of the world. The bunker provides a place to escape the overwhelming nature of constant communication and urges us to slow down the pace, focussing on ourselves in order to look out again for a better understanding of ourselves within our surroundings. The exhibition “Faraway, So Close!” explores the structure of the bunker as a secluded space where we can investigate the gap between external reality and internal experience. The visitor follows a journey that begins with introspection and inner questions, gradually leading outwards to the self in context with the world. Starting with intimate cells that put the spectator face-to-face with a particular artwork, the exhibition moves on to bigger rooms where art pieces approach thematics of social interactions and constructions. Artists: Mario Asef, Stuart Bailes, Ivan Bošković, Stephanie Comilang, Jenny Ekholm, Boris Eldagsen, Assaf Gruber, Brendan Howell, Gemis Luciani, Paula Muhr, Julian Oliver, Olve Sande, Elizabeth Skadden, Kasper Vang, Kim Westerström. Curated by: Anastasia Albokrinova, Kordula Fritz-Srbic, Valentina Galossi, Carolina Jiménez, Kenneth Padre Paranada, Paz Ponce Perez-Bustamante, Nicola Ricciardi, Alexia Werrie. Organized by: Node Center for Curatorial Studies, in collaboration with Grimmuseum and Künstlerhaus Bethanien. Catalogue issued on occasion of Faraway, so close! * Residency program and book edition directed by Perla Montelongo, coordinated by Lauren Reid and designed by Laura d’Ors. Photography: Laura Gianetti and the artists.